While aboard the NOAA Ship Oregon II, I was able to create some art, which is my absolute passion in life. I was able use my time before and after most shifts to draw and paint the fish and sharks with watercolor paint and water from the ocean. 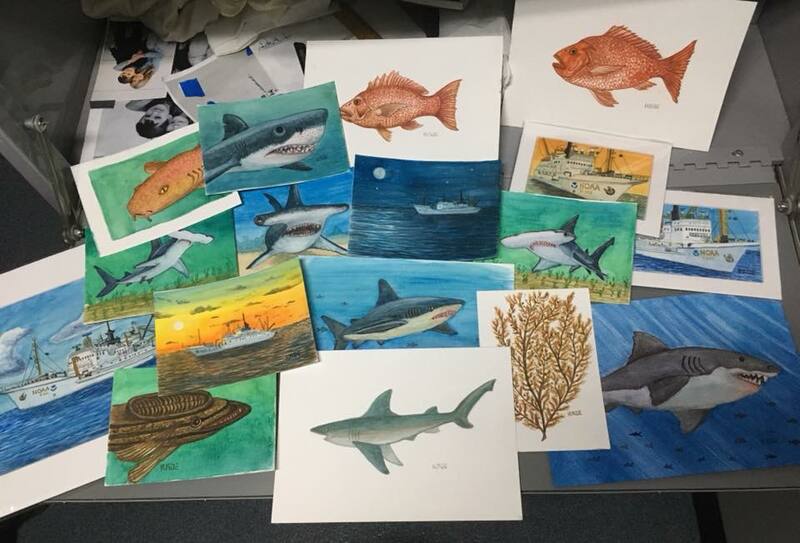 It was tricky to paint with the constant movement of the ship, but I was able to paint over 20 paintings of sharks, fish, and the Oregon II over the 16 days on board the ship. Now that I’ve been home for a month, I’ve had some time to reflect on my NOAA Teacher at Sea experience. If I told you my NOAA Teacher At Sea experience was incredible, I would be understating it quite a bit. 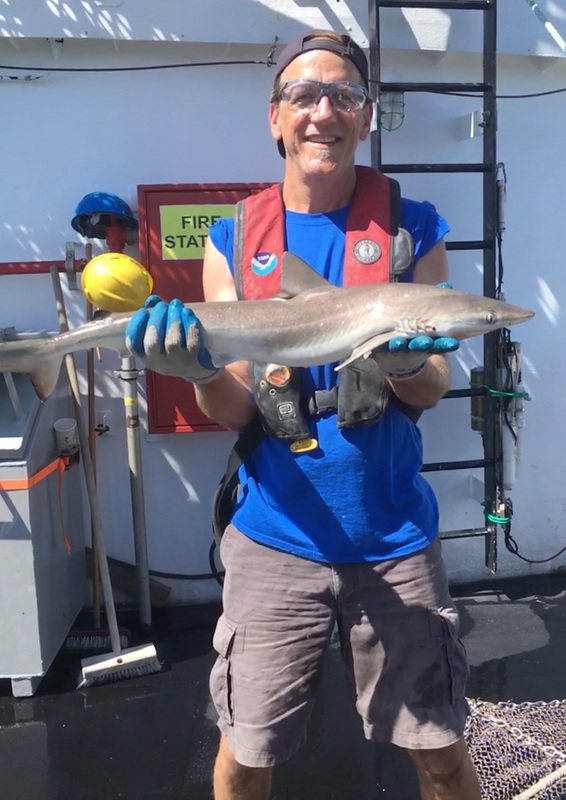 I knew the excitement of working on the mighty NOAA Ship Oregon II and participating in the shark survey would be a highlight of my lifetime for sure. 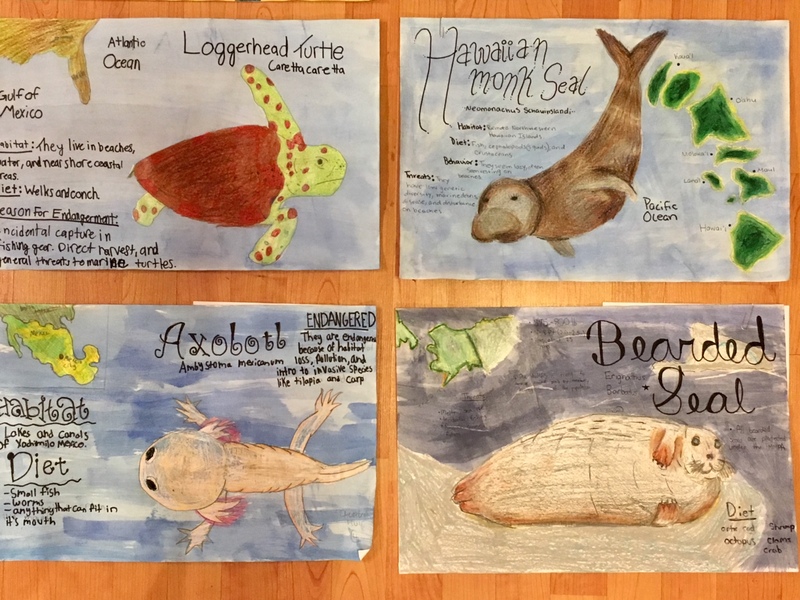 The opportunity to work with NOAA scientists, fishermen, and the rest of the crew was the best learning experience a teacher and artist could ask for. But just a week after returning, it was back to school and I needed to find ways to convey what I learned to my students. I began by creating a digital infographic about Longline Fishing so they would have a visual to go along with my explanation. 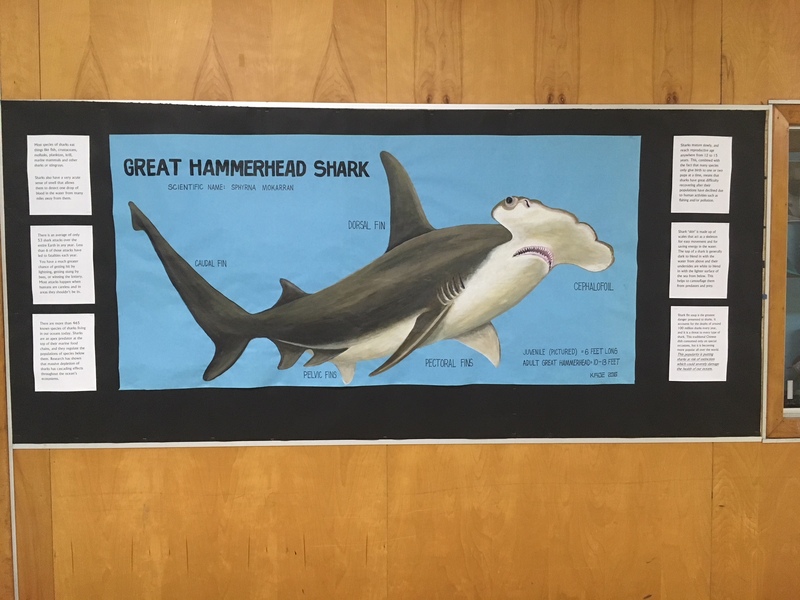 I wanted to inform my students to create awareness about the species of shark and other ocean inhabitants that are threatened and endangered. 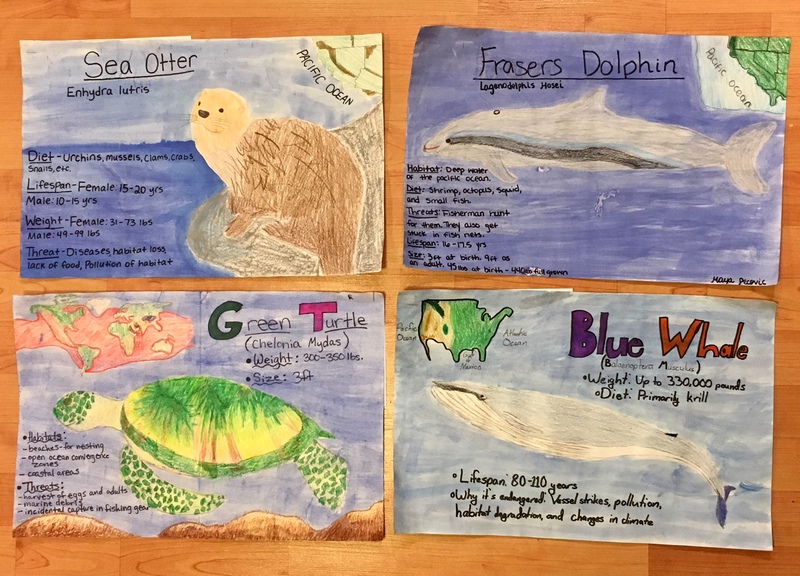 I also wanted them to learn science about the animals and incorporate some of that data into their art to make their images more impactful to those that see them. We want to compile related projects together until later in the year for our annual Night of the Arts- NOAA Edition. 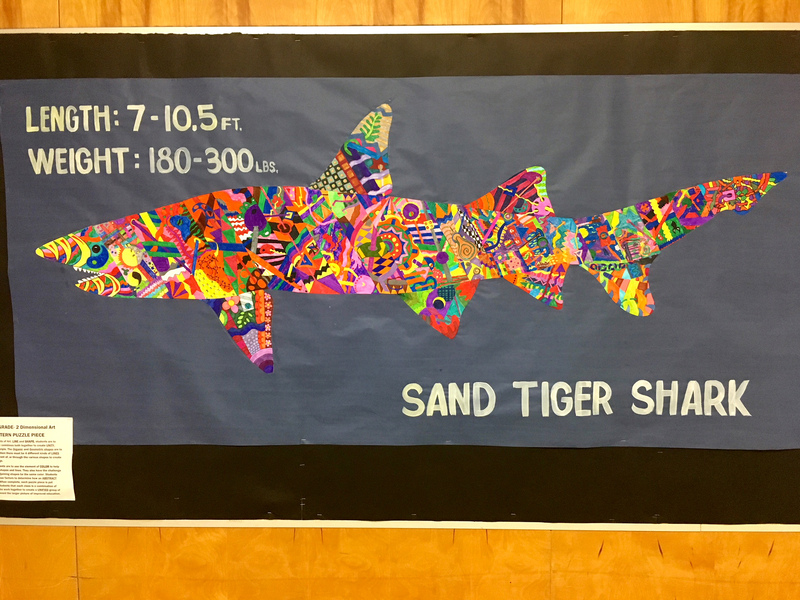 We also created three life size Art Shark paintings and posted them in the hallways of our school to advocate for sharks through art and work to give sharks a more positive community image, and not the sensational, fearful media portrayal of sharks. As a fine artist painter, the Teacher At Sea experience has helped to make my artwork much more accurate for several reasons. Primarily the reason was proximity. I was able to see the sharks and fish first hand everyday, and take many reference photos of our catch each day. I could now see the beautiful colors of different sharks while out of the water, which I never had seen before. I was also able to speak to the fishermen and scientists each day about the behaviors and biology of the fish and I gained insight from listening to their vast experiences in the oceans all around the globe. 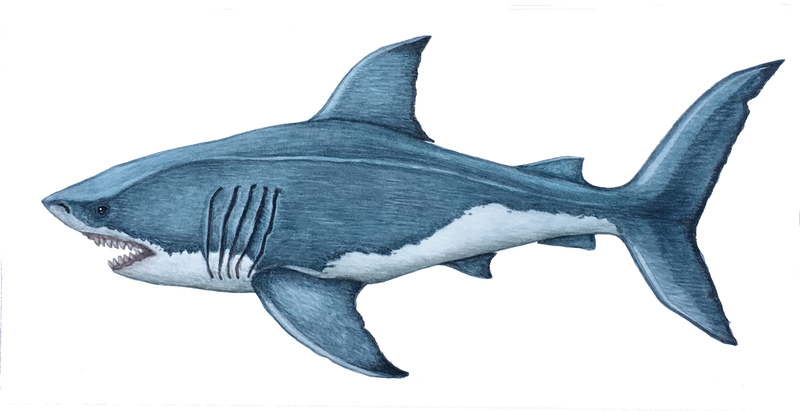 Since being home, I’ve begun to paint a series of scientifically accurate side views of my favorite sharks, and eventually I will digitally compile them into one poster after I get 15 to 18 completed. After that, I’ll begin a series of paintings with sharks swimming in their natural environment to bring more color and visual dynamics onto the canvas. This has been the most inspiring adventure of my life, and I will continue to advocate for my favorite ocean animals by using art to bring the respect and admiration that these beautiful sharks deserve to continue to thrive long into Earth’s distant future. Weather Data from Bridge: Wind speed 14 knots, Air Temp: 27c, Visibility 10 nautical miles, Wave height 2 ft.
Longline fishing is a technique that consists of one main fishing line with many baited hooks that come of that line on shorter lines, (like branches off a tree) attached at various distances. Long lines are used in both coastal areas and the open ocean and are often placed to target specific species. If the long line is suspended in the top or mid depth water, it is called pelagic longline fishing. If it is on or near the ocean floor by weighting it down to the sea floor, it is called bottom longline fishing. A high-flyer buoy is placed at either end to mark the position of the line in the water so boats can see it while submerged, and so it can be found when it needs to be retrieved. Weights are placed on each end and the middle of the line to hold the line down to a specified depth. 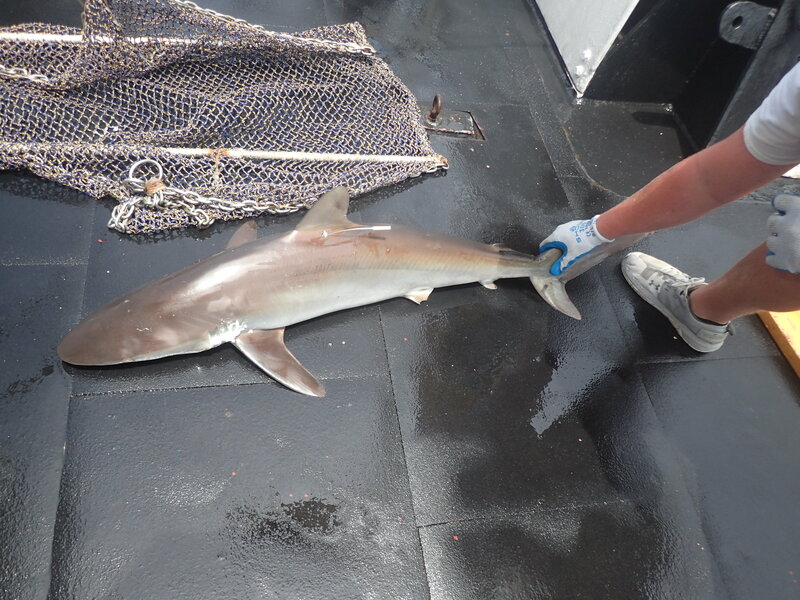 On board NOAA Ship Oregon II, the mission is a red snapper/shark longline fishing survey in the Gulf of Mexico and the Western North Atlantic coast. 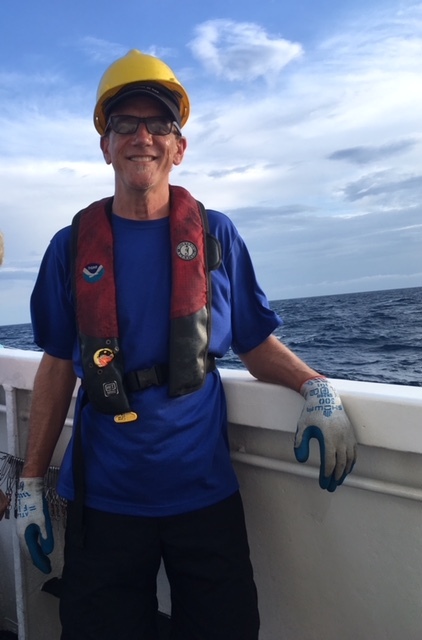 I was on the first of four legs of the survey that left Pascagoula, Mississippi, rounded the bottom of Florida and stopped for 44 stations between West Palm Beach FL, up to Cape Hatteras, NC, and back down to Port Canaveral, FL. 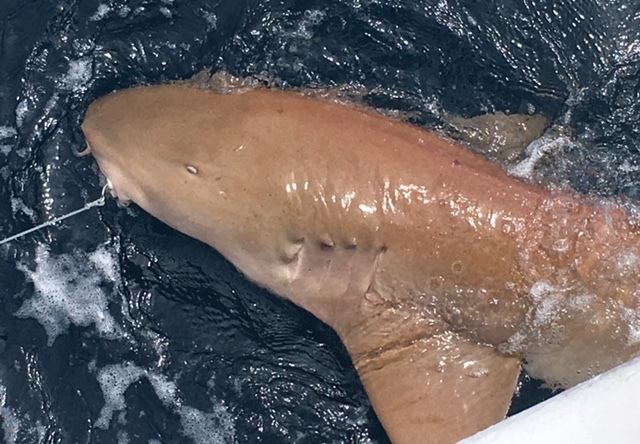 NOAA’s mission is to research current shark and snapper populations in specific areas as determined by NOAA shark scientists and related state Fishery Departments. The Oregon II has a large spool of 3mm monofilament fishing line on deck. 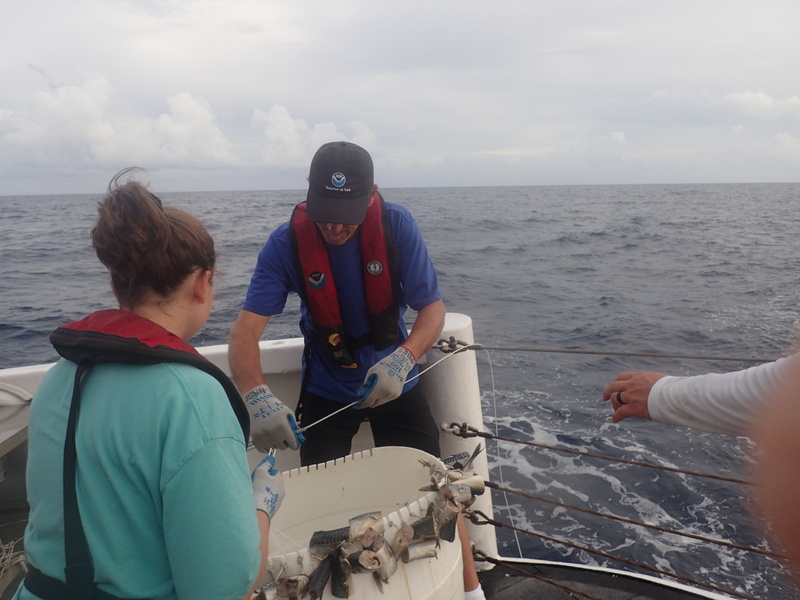 For our survey, we used a line that was one mile long, and had 100 baited hooks approximately 50 feet apart. The hooks are attached to the line by gangions. Gangions are 12 foot long monofilament lines with a hook on one end and a manual fastener at the other end that can be taken on and off each time the line is deployed. All 100 hooks on the gangions are baited with Atlantic mackerel. To deploy the line into the water, it takes a team of 6 people. The first person strings the line from the spool and through various pulleys along the length of the ship moving toward the back of the boat before tying it to the high flyer buoy and returning to the spool control to deploy the mile long line into the water. A team of two works to attach a specific number tag onto each gangion, and then to retrieve the 12 foot long gangion from a barrel. The numbered, baited, gangions are handed one by one to the next team member who attaches the gangion of the main long line every 60 feet as the line descends into the water. 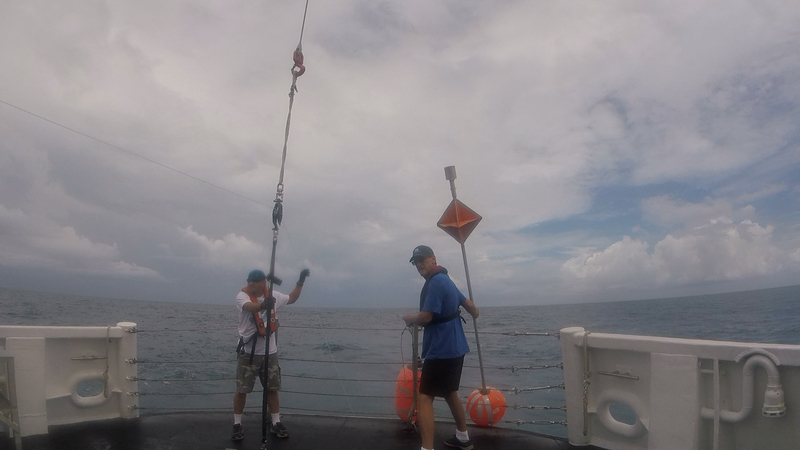 This crewman also places three weights on the line to hold it onto the ocean floor, one at each end, and one in the middle. When all hooks are deployed, the line is cut from the spool and the high-flyer buoy is attached to mark the end of the line in the water. Deploying the high-flyer buoy after all 100 gangions and weights are attached. The last member of the science team is at a computer station on deck and they are in charge of inputting data into the computer. Each time a buoy, weight, or gangion goes into the water, a specific button is pushed to mark the items place in the water. 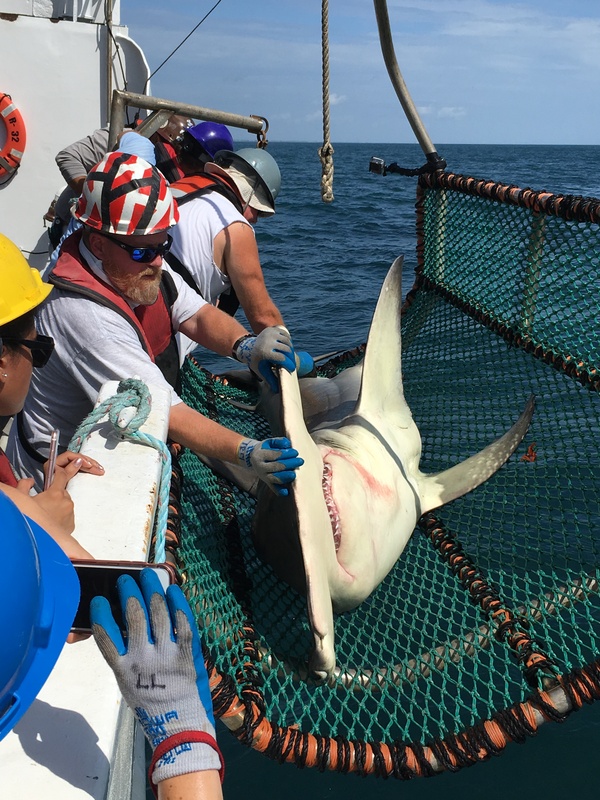 This is done so when a shark comes up on a numbered hook, NOAA scientists know exactly the latitude, longitude and depth of where that specific shark was caught. Scientists upload this important data immediately to NOAA servers for later use so they can assess average populations in specific areas, among many other data points. Each time a gangion, weight, or high-flyer buoy is deployed, its location is input in the computer. The bait stays down on the ocean floor for about an hour before the boat returns to retrieve it. 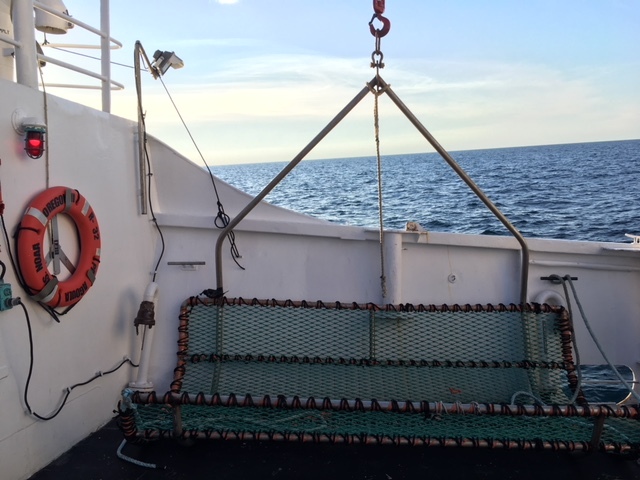 The retrieval process is similar to deploying the line except that it takes longer to bring it in, as there are now some fish and sharks attached to the hooks. If the hooks are empty, the number is taken off the line, and the gangion is placed back in the barrel until the next station. 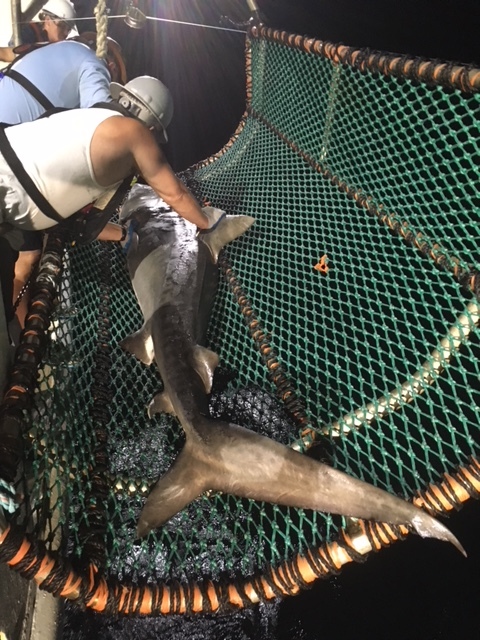 If there is a shark or fish on the line, it is pulled onto the deck and data is collected before the shark is safely placed back into the water. The first step is unhooking the fish, before it is measured. The shark is measured from the tip of the nose to various parts of the body to determine the size in those areas. The gender of the shark is also determined, as well as the maturity. Finally, the shark is weighed on a scale and most are tagged before being photographed and released. The process only takes about two minutes to safely ensure the shark survives. The data is recorded on a data log, and after the retrieval, the data is input into a database. Gangions are taken off the long line, de-baited, de-numbered and put back in barrel. Before coming on the Oregon II, I knew only about the fishing process on a larger scale from what I’d read about, or seen on television. I was slightly intimidated that without experience, I’d likely be slowing down the experienced team of professionals from their difficult job. 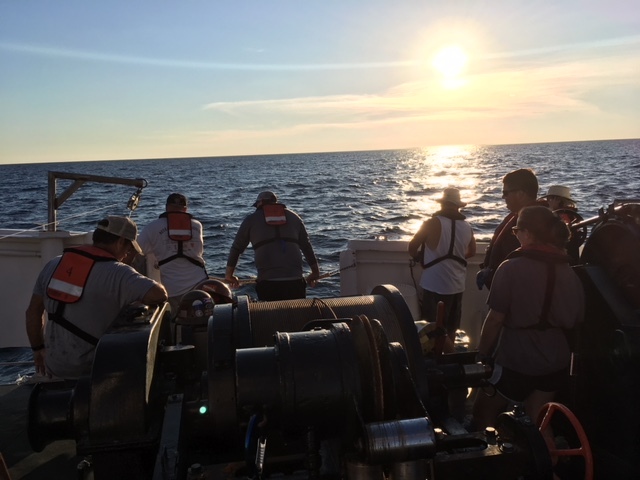 As we headed out to sea, I found out it would take a few days before we reached our first station and that gave me time to get to know the crew, which was very valuable. There are two crews, each work 12 hours a day, so fishing was happening around the clock. I was able to listen to their advice and explanation of the techniques used in the long line process, and also some fantastic stories about their lives and families. Their patience with me and the other volunteers during those first few stations gave us time to get up to their speed, and from then out it was like clockwork. It was certainly hard to work outside all day, but the passion, skill, and humor of the crew made it quite fun work each day and night. 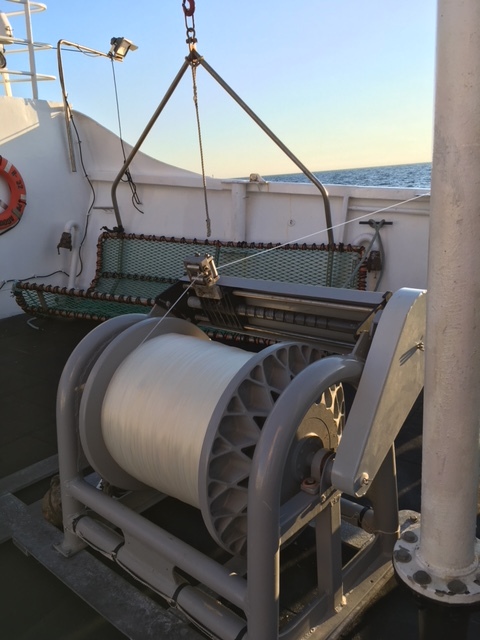 It was impressive and amazing to see how this efficient process is used to help NOAA scientists and fishermen collect data from vast areas of the ocean for two weeks. 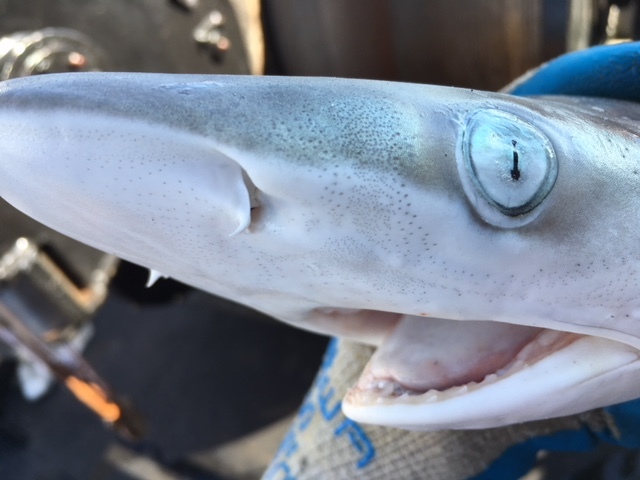 I am proud to say I helped a great team to get information that can help us understand how to help populations of sharks and fish for long into the future. Weather Data from Bridge: Wind speed 11 knots, Air Temp: 30c, Visibility 10 nautical miles, Wave height 3 ft. Sharks have senses similar to humans that help them interact with their environment. They use them in a specific order and rely on each one to get them closer for navigational reasons, and to find any food sources in the area around them. The largest part of the shark’s brain is devoted to their strong sense of smell, so we’ll start there. Smell– Sharks first rely on their strong sense of smell to detect potential food sources and other movement around them from a great distance. Odor travels into the nostrils on either side of the underside of the snout. As the water passes through the olfactory tissue inside the nostrils, the shark can sense or taste what the odor is, and depending which nostril it goes into, which direction it’s coming from. It is said that sharks can smell one drop of blood in a billion parts of water from up to several hundred meters away. Sharks can also sense electrical currents in animals from long distances in several ways. Sharks have many electro sensitive holes along the snout and jaw called the Ampullae of Lorenzini. These holes detect weak electrical fields generated by the muscles in all living things. They work to help sharks feel the slightest movement in the water and sand and direct them to it from hundreds of meters away. This system can also help them detect the magnetic field of the earth and sharks use it to navigate as well. Hearing– Sharks also heavily use their sense of smell to initially locate objects in the water. There are small interior holes behind their eyes that can sense vibrations up to 200 yards away. Sound waves travel much further in water than in the air allowing them to hear a great distance away in all directions. They also use their lateral lines, which are a fluid filled canal that runs down both sides of the body. It contains tiny pores with microscopic hairs inside that can detect changes in water pressure and the movement and direction of objects around them. Sight– Once sharks get close enough to see an object, their eyes take over. Their eyes are placed on either side of their head to provide an excellent range of vision. They are adapted to low light environments, and are roughly ten times more sensitive to light than human eyes. Most sharks see in color and can dilate their pupils to adapt to hunting at different times of day. Some sharks have upper and lower eyelids that do not move. 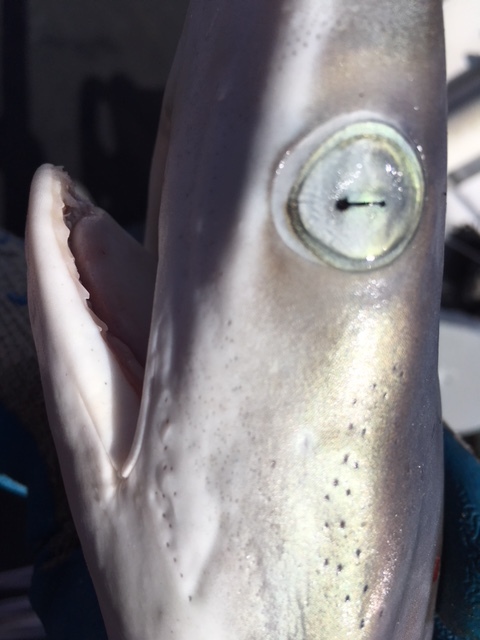 Some sharks have a third eyelid called a nictitating membrane, which is an eyelid that comes up from the bottom of the eye to protect it when the shark is feeding or in other dangerous situations. Other sharks without the membrane can roll their eyes back into their head to protect them from injury. Touch– After using the previous senses, sometimes a shark will swim up and bump into an object to obtain some tactile information. They will then decide whether it is food to eat and attack, or possibly another shark of the opposite gender, so they can mate. Taste– Sharks are most famous for their impressive teeth. Most people are not aware that sharks do not have bones, only cartilage (like our nose and ears) that make up their skeletal system, including their jaw that holds the teeth. The jaw is only connected to the skull by muscles and ligaments and it can project forward when opening to create a stronger bite force. 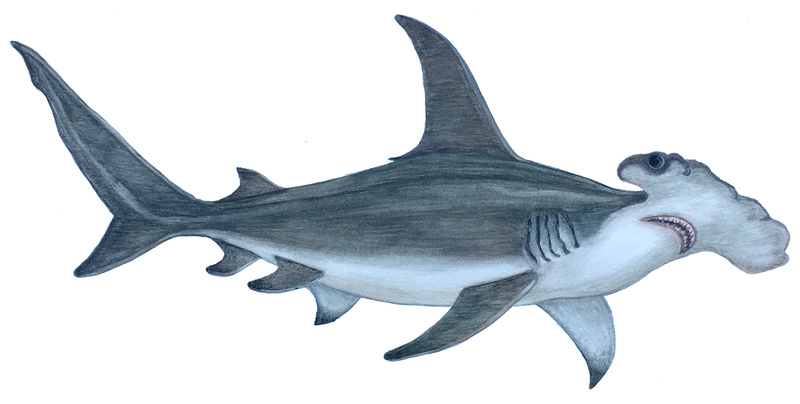 Surface feeding sharks have sharp teeth to seize and hold prey, while bottom feeding sharks teeth are flatter to crush shellfish and other crustaceans. The teeth are embedded in the gums, not the jaw, and there are many rows of teeth behind the front teeth. It a tooth is damaged or lost, a new one comes from behind to replace it soon after. Some sharks can produce up to 30,000 teeth in their lifetime. While I had a general knowledge of shark biology before coming on this trip, I’ve learned a great deal about sharks during my Teacher at Sea experience aboard the Oregon II. Seeing, observing, and holding sharks every day has given me first hand knowledge that has aided my understanding of these great creatures. The pictures you see of the sharks in this post were taken by me during our research at sea. I could now see evidence of all their features up close and I could ask questions to the fishermen and scientists onboard to add to the things I read from books. As an artist, I can now draw and paint these beautiful creatures more accurately based on my reference photos and first hand observations for the deck. 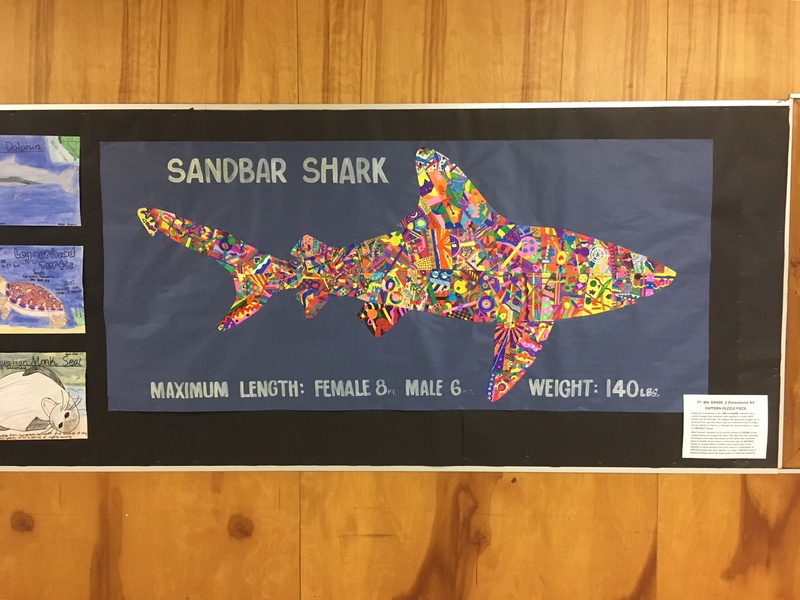 It was amazing to see that sharks are many different colors and not just different shades of grey and white you see in most print photographs. I highly encourage everyone that has an interest in animals or specific areas of nature to get out there and observe the animals and places firsthand. I guarantee the experience will inspire you, and everyone you tell of the many great things to be found in the outdoors. Normally you wouldn’t hear the words shark and cradle in the same sentence, but in our case, the cradle is one of the most important pieces of equipment we use each day. 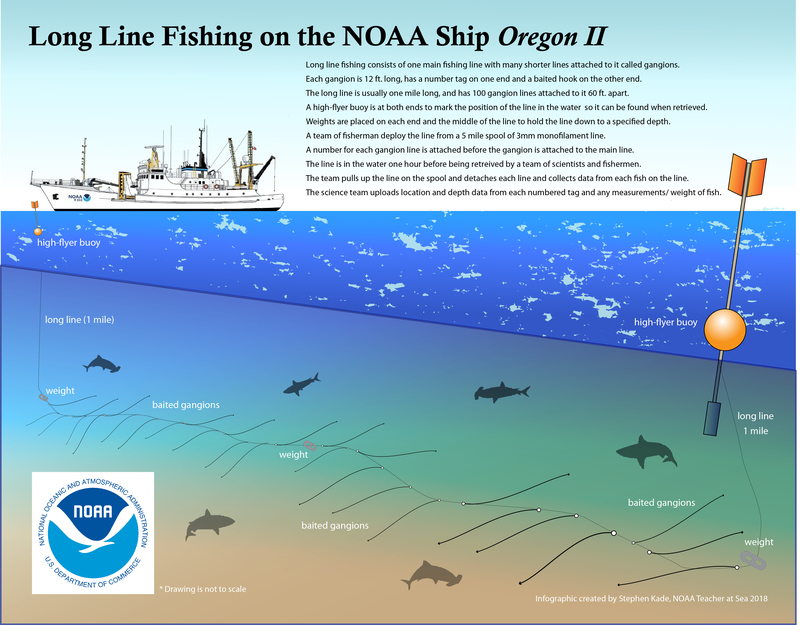 Our mission on the Oregon II is to survey sharks to provide data for further study by NOAA scientists. We use the long line fishing method where 100 hooks are put out on a mile long line for about an hour, and then slowly hauled up by a large mechanical reel. If a shark is generally three feet and weighs 30lbs or less, it is handled by hand to carefully unhook, measure and throw back. If the shark is much larger and cannot be managed safely by hand, it is then held on the line by the ships rail until it can be lifted on deck by the cradle to be quickly measured, tagged, and put back into the ocean. The shark cradle is 10 ft. long, with a bed width of roughly 4 feet. It is made from thick aluminum tubing and strong synthetic netting to provide the bed for the shark to lie on. It is lifted from the ship’s deck by a large crane and lowered over the ships rail into the ocean. The shark is still on the line and is guided by a skilled fisherman into the cradle. The crane operator slowly lifts the cradle out of the water, up to the rail, so work can begin. A team of 3 highly skilled fishermen quickly begin to safely secure the shark to protect it, and the team of scientists collecting data. They secure the shark at 3 points, the head, body and tail. 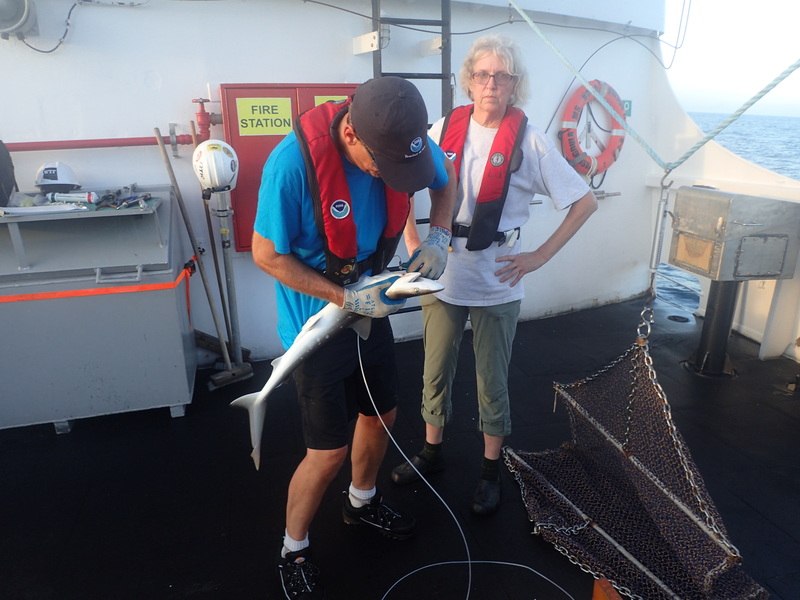 Then the scientists come in to take 3 measurements of the shark. The precaudal measurement is from the tip of nose to the start of the tail. The fork measurement is from the tip of the nose to the fork of the tail (the place where the top and bottom of the tail meet). Finally there is a total length taken from the tip of the nose to the furthest tip of the tail. When all measurements are complete, a tag is then placed at the base of the first dorsal (top) fin. First a small incision is made, and then the tagger pushes the tag just below the skin. The tag contains a tracking number and total length to be taken by the person who finds the shark next, and a phone number to call NOAA, so the data can recorded and compared to the previous time data is recorded. The yellow swivel tags, used for smaller sharks, are identical to ones used in sheep ears in the farming industry, and are placed on the front of the dorsal fin. The measurements and tag number are collected on the data sheet for each station. The data is input to a computer and uploaded to the NOAA shark database so populations and numbers can be assessed at any time by NOAA and state Departments of Natural Resources. A skilled fisherman removes the hook so the shark can be released. The longline is mile long and carries up to 100 hooks. The shark is then unhooked safely by a skilled fisherman while the other two are keeping the shark still to protect both the shark and the fishermen from injury. The cradle is then slowly lowered by crane back into the ocean where the shark can easily glide back into its environment unharmed. The cradle is then raised back on deck by the crane operator, and guided by the two fishermen. All crew on deck must wear hardhats during this operation as safety for all is one of NOAA’s top priorities. This process is usually completed within 2 minutes, or the time it took you to read this post. It can happen many times during a station, as there are 100 hooks on the one mile line. It is amazing for me to see and participate in the long line fishing process. I find it similar to watching medical television shows like “ER” where you see a highly skilled team of individually talented members working together quickly and efficiently to perform an operation. It can be highly stressful if the shark is not cooperating, or the conditions aren’t ideal, but each member always keeps their cool under this intense work. It’s also amazing to see the wealth of knowledge each person has so when an issue arises, someone always knows the answer to the problem, or the right tool to use to fix the situation, as they’ve done it before. 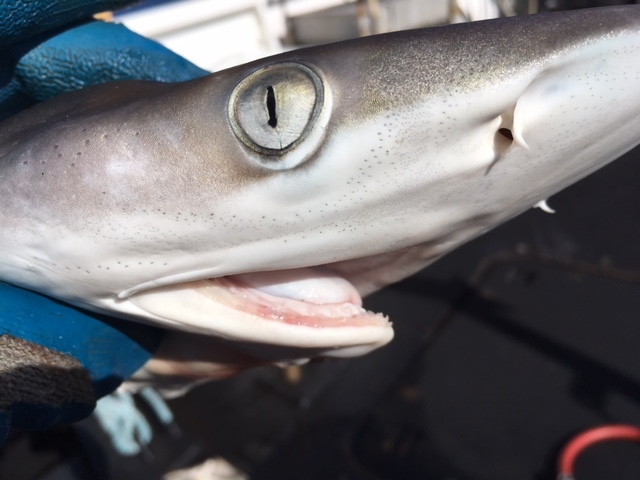 While our main mission aboard the NOAA Ship Oregon II is to survey and study sharks and red snapper, it is also very important to understand the environmental conditions and physical properties of the sea water in which these animals live. The CTD instrument is used to help understand many different properties within the water itself. The acronym CTD stands for Conductivity (salinity), Temperature, and Depth. Sensors also measure dissolved oxygen content and fluorescence (presence of cholorphyll). The CTD instrument itself is housed in a steel container and is surrounded by a ring of of steel tubing to protect it. Conductivity is a measure of how well a solution conducts electricity and it is directly related to salinity, or the salt that is within ocean water. 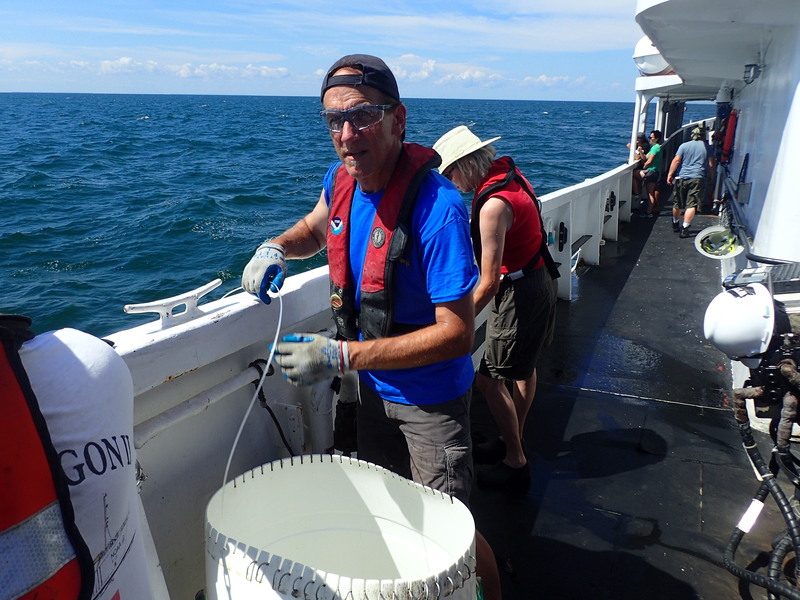 When salinity measurements are combined with temperature readings, seawater density can be determined. This is crucial information since seawater density is a driving force for major ocean currents. The physical properties and the depth of the water is recorded continuously both on the way down to the ocean floor, and on the way back up to the surface. 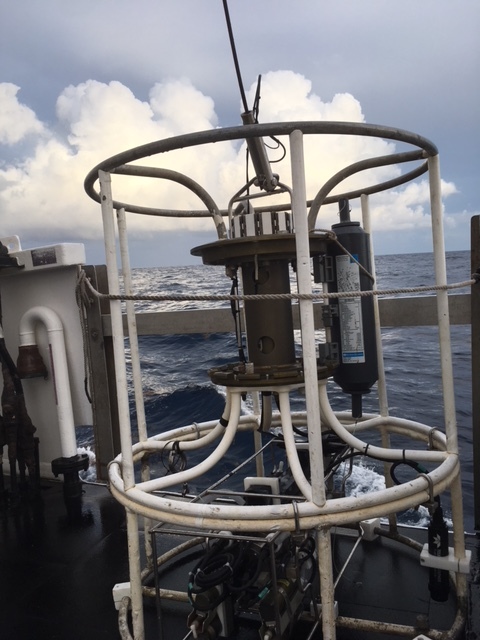 There is a light, and a video camera attached to the CTD to provide a look at the bottom type, as that is where the long line is deployed, and gives us a good look at the environment where our catch is made. These data can explain why certain animals gather in areas with certain bottom types or physical parameters. This can be particularly important in areas such as the hypoxic zone in the Gulf of Mexico. This is an area of low oxygen water caused by algal blooms related to runoff of chemical fertilizers from the Mississippi River drainage. The CTD instrument itself is housed in a steel container and is surrounded by a ring of of steel tubing to protect it while deployed and from bumping against the ship or sea floor. Attached water sampling bottles can be individually triggered at various depths to collect water samples allowing scientists to analyze water at specific depths at a particular place and time. The entire structure is slowly lowered by a hydraulic winch, and is capable of making vertical profiles to depths over 500 meters. An interior computer display in the ship’s Dry Science Lab profiles the current location of the CTD and shows when the winch should stop. We have found this to be a tricky job, during large wave swells, as the boat rocks quite a bit and changes the depth by a meter or more. The operator must be very careful that the CTD doesn’t hit the ocean floor too hard which can damage the equipment. An interior computer display in the ship’s Dry Science Lab profiles the current location of the CTD and shows when the winch should stop. 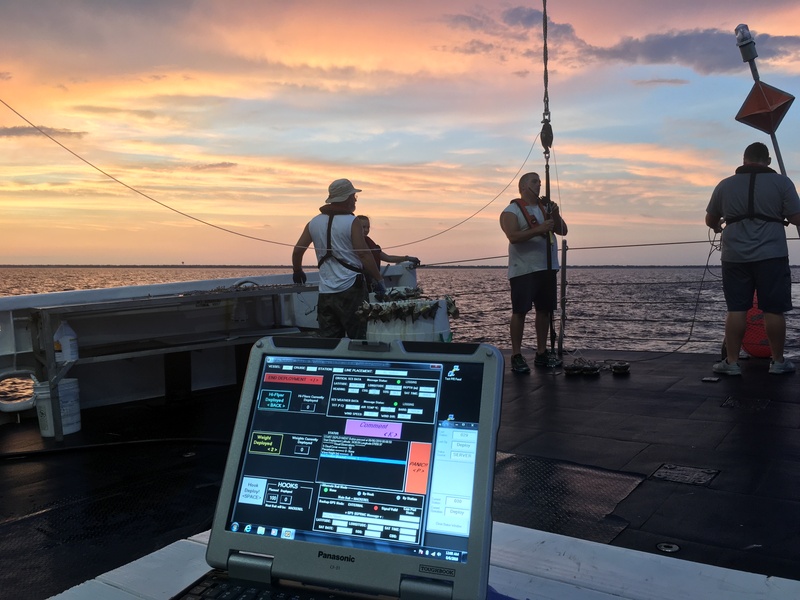 The data collected while deployed at each station is instantly uploaded to NOAA servers for immediate use by researchers and scientists. The current data is also available the general public as well, on the NOAA website. Once safely back aboard the Oregon II, the CTD video camera is taken off and uploaded to the computer, The CTD must be washed off and the lines flushed for one minute with fresh water, as the salt water from the ocean can damage and corrode the very sensitive equipment inside. The instrument is also calibrated regularly to ensure it is working correctly throughout all legs of the long line survey. I am having such a great time during my Teacher at Sea experience. In the 9 days aboard ship so far, we have traveled the entire coasts of Mississippi, Arkansas, Florida, South Carolina, and North Carolina. Never in my life did I think I would get an opportunity to do something like this as I’ve dreamed about it for decades, and now my dreams have come true. I’m learning so much about fishing procedures, the biology of sharks, navigational charting, and the science of collecting data for further study while back on land at the lab. I can’t wait to get home and spread the word about NOAA’s mission and how they are helping make the world a better place, and are advocating for the conservation of these beautiful animals! 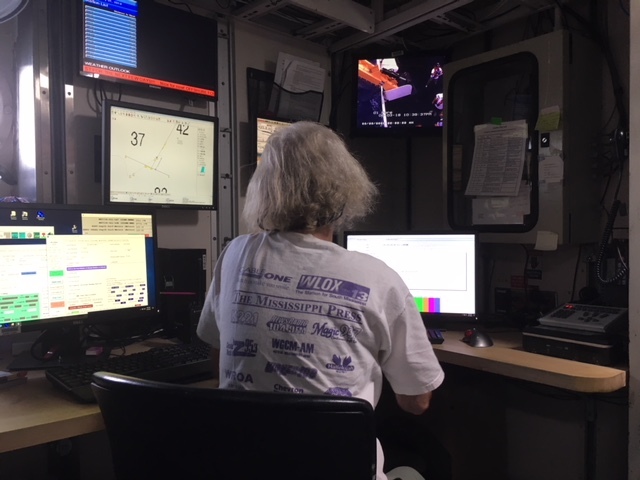 During my NOAA Teacher at Sea experience, I have truly been inspired and impressed by how many important roles of our operation on the Oregon II are fulfilled by females. One of the most important crew members is Ensign (ENS) Chelsea Parrish who is one of our OOD’s. or Officers of the Deck. I think her story will inspire my daughter and female students to aim high for their future! As a young child, Chelsea was inspired by her father who spent 20 years in the US Navy. She loved hearing stories about his role working aboard Navy submarines, and all of the interesting things one must do to work below the sea. After high school she attended the Savannah State University, in Georgia. 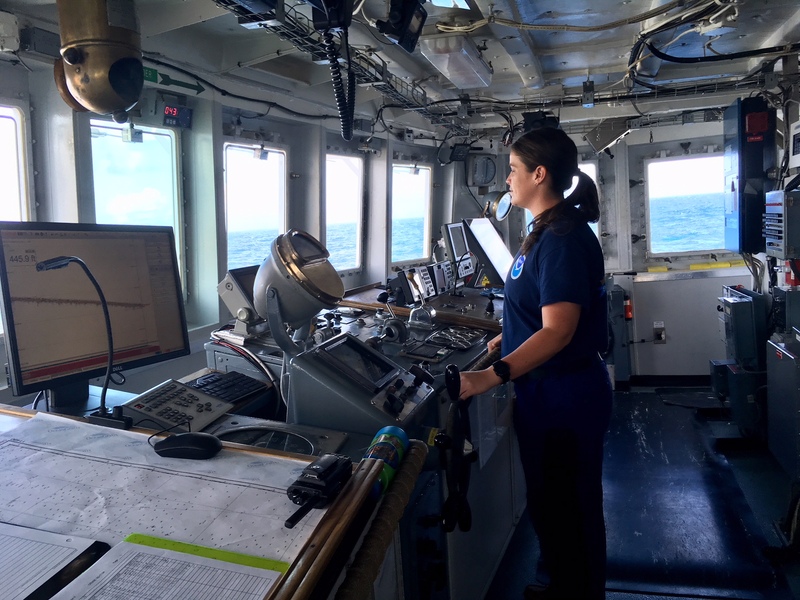 She was able to train aboard the R/V Savannah where she learned about biological, chemical, physical, and geological oceanographic studies in estuaries and continental shelf waters in the southeastern US Atlantic and Gulf coasts. She earned her Bachelor degree in Biology, and received her Masters degree in Marine Science. While she didn’t need her Masters to get into her field, she knew that in the long run it would put herself above others in a highly competitive field and would be an advantage in the future. A year into graduate school, she attended a conference, where she learned about the NOAA Corps. The NOAA Corps is one of the seven federally uniformed services of the United States, and is made up of scientifically and technically trained and commissioned officers. It was there that she met Lt. Commander Adler, whom she kept in contact with. Just a short time later, she was called for an open opportunity to join the NOAA Corps. She had 17 weeks of real world training at the Coast Guard Academy for Officer Candidate School (OCS). It was there that she learned how NOAA is different than the US Navy. The Navy focuses on various military actions, while NOAA Corps focus is on science and their motto is: “Science, Service, Stewardship”. It was then Chelsea knew she came to the right place to fulfill her professional goals. After graduating from training, she earned her Officer of the Deck qualification aboard Oregon II in September, 2017. She will be aboard completing her assignment in January, 2019. Chelsea has many important duties to perform on the ship, including steering the ship. This entails following the chart that the CO (Commanding Officer, or Captain) has planned out to fulfill the mission of the ship. In our case the mission is long line fishing of Red Snapper and Sharks at many stations along the southeastern US and the Gulf of Mexico. While the CO is off duty, she must keep him informed of any changes that need to made to the Navigation trackline to ensure there is a safe navigational watch during her shift, which is normally 4 hours at a time. The most common thing to happen that happens to create a change in course is foul weather, but there are many unforeseen events as well. Chelsea must study reports from the US Coast Guard which let her know various events happening in the region we are sailing. This can be other ships performing science missions, merchant navy ships of other countries in the area, oil drilling operations, or in our case yesterday, live ammunition firing exercises by the US Navy. Chelsea is also the environmental compliance officer aboard the ship, and she must follow specific rules set up by the EPA (Environmental Protection Agency) to ensure Oregon II is environmentally responsible while at sea. She must be sure there aren’t any issues with fuel, garbage, or any other foreign substance being put in the ocean while at port, or at sea. She also keeps a recycling log to track all activity and incidents that occur. Chelsea also runs the ship store and keeps track of all the items to be sold to the crew and volunteers aboard the ship. Finally, Chelsea is the go- to rescue swimmer aboard Oregon II, and is the first to jump into the ocean if there is someone overboard to be retained from our ship, or another at sea near us. I saw her in action during our drills at the beginning of our trip and I was impressed at how quickly the crew launched our rescue boat, so Chelsea could rescue our life ring that acted as our “person overboard”. She also took a 3 week class to get certified as a NOAA working scuba diver. This certification allows her to be in the ocean to find, and/or fix any issues we have with the ship while at sea that can’t be fixed from the deck or rescue boat. She is certified to dive down to 130 feet below the surface. It certainly is impressive how much Chelsea has accomplished in her 28 years. I hope this post inspires all my students, but especially the girls to go out into the world and do anything they can dream of, as that is exactly what Chelsea did. When her time aboard Oregon II is over, Chelsea plans to be a Cetacean Photogrammetry Specialist in La Jolla, California. She will be getting to get her FAA drone license to fly hexacopter drones from ships. Her duties will be to find, count and track marine mammals such as seals, dolphins, and whales. She said she loves helping NOAA fulfill their mission of helping marine animals and data collecting to further the study of these creatures and helping ensure their survival in the future. Now that I am almost a week into the survey, I am starting to fall into the rhythm of working on the ship. The 12 hour work days are certainly long, but we do get breaks between stations to rest, converse, and prepare for the next run. If it’s a good station and we haul in a lot of catch, we often spend time talking about each of the things we caught and become like kids on Christmas if it’s something new and interesting. We also spend time logging all the data we collect into the computer for later research on land. We have seen just about all the different weather scenarios you could imagine, and have endured bright, 93 degree cloudless days, and windy days with 6 foot waves and pouring rain. We’ve had to call off a few stations until our way back south down the coast due to poor conditions, because on all NOAA ships, the motto is “Safety First”. The real trick is working during the big wave conditions and learning how to function as a human being while the boat is rocking and rolling all about for the entire day. I’m getting better at anticipating where my next step will land and compensating for the constant shifting gravity under my feet. It will make walking on earth again seem so easy!